Soap operas have told moving and relatable stories since the radio days, but the art of socially relevant storytelling was perfected by Agnes Nixon, a writer for one of the legendary founders of the genre, Irna Phillips, who went on to create iconic daytime dramas such as One Life to Live and All My Children. In the 1960s, the “Queen of Soaps” ushered in an “Era of Relevance” in daytime television with stories ranging from Bert Bauer battling uterine cancer on The Guiding Light to Carla Gray passing for white on One Life to Live. Despite the occasional true-to-live dramatization, soap operas (sometimes referred to as washboard weepers) had primarily centered on domestic and family issues, particularly relationship conflicts, extramarital affairs and multi-generational drama. Nixon retained the focus on domestic issues, but also widened the soap story canvas. She took a cue from nascent first-wave feminism, which declared, “the personal is political,” meaning the states of various social issues play out not only in the broader culture in some abstract way, but in people’s personal lives. And so Nixon brought them to soaps, in characters’ personal lives, which drive the daytime serial. One look at Nixon showed her tender nature—a warm smile, skin so delicate it seemed almost papery, and eyes that twinkled and contained miles of depth. Inspired partially, no doubt, by the bras burning, fists raised in protest, and demonstrators refusing to be moved in sit-ins all over the country, as well as her own upbringing in Nashville, Nixon wove into her story fabrics, creating and working as she did on many soaps, characters facing, living, and navigating prescient social issues. Nixon creation One Life to Live featured a love triangle in 1968, with both a white man and black man interested in Carla Gray. Once it was revealed that Carla was an African America woman passing as white, the viewers that had had reservations about her relationship with the black man suddenly found the white man objectionable. The story made the audience think, and question their own feelings about race in America. A few years later, Erica Kane had TV's first legal abortion on All My Children, just as Roe vs. Wade was being decided in the Supreme Court. In 1983, Nixon’s newest soap, Loving, featured the story of Mike Donovan, who suffered from Post-Traumatic Stress Syndrome years after leaving Vietnam. These are only three examples out of many of important issue stories featured in daytime, taking center stage for months, even years, as soap storylines do. "I think that a really good daytime serial soap reflects what's happening. That's certainly what we're trying to do when we want people to examine their prejudices and so on, but I also that think we do more than that—we reflect changes, too. When mothers marched for peace in 1970 in All My Children, we were copying the marches that there had already been. It works both ways,” Nixon told journalist Connie Pasquala in 1997. Other soap writers followed suit, and soon daytime abounded with stories exploring homelessness, veterans’ issues, HIV/AIDS, and alcohol and drug addiction, among others. This heavy concentration and focus on “issue storylines,” as some soap industry members came to and still do call them, became a regular part of soaps well before primetime TV dared address them. Even today, though, when other television formats have caught up to daytime, they cannot address social issues the way soaps do, for they cannot match the temporally long and emotionally deep bonds viewers share with their soaps and soap characters. In a recent interview, soap legend Andrea Evans said of the one-of-a-kind bond, “When you go into someone’s home every day for an hour, it’s a different relationship [than other entertainment formats]—a much more personal relationship.” The more intense the relationship between viewers and characters, the more intense will be the effect of experiencing the ups-and-downs of those characters’ lives with them. Soap writers such as Douglas Marland, Matt and Claire Labine, and The Bells, to name just a few, continued and continue the “Era of Relevance” into the present, positioning soap operas at the vanguard of the entertainment community in addressing social issues—all the while captivating their audiences. This sea change in soap content has become the norm for daytime. According to criticalmediaproject.org, “Media creates meanings about sexuality (or sexual orientation), and plays an important role in the way we understand the role sexuality plays in our identities, our history, our social institutions, and our everyday lives.” The tragedies and triumphs of the lesbian, gay, bisexual, transgender, and queer (LGBTQ) community that soap writers included in their shows accomplish in a positive way just what the above quote points out that media can do. In honor of their brave—and life-changing for many viewers, no doubt—commitment to do so, I will assess with a grade (A-F) the state of LGBTQ representation and treatment of such characters on the four soaps on the air today along with some thoughts on each soap’s LGBT state of affairs. Hopefully, this will encourage continued and expanded inclusion of LGBTQ characters and concerns in daytime. I see LGBTQ representation in soaps as a three-fold matter. First, when considering an addressing of the community’s concerns, we must consider whether there are LGBTQ characters on the soap and whether they are contract players (meaning they will be on for a significant amount of time and usually writers must write story for them) or recurring characters (meaning the show does not guarantee them their own storylines). Second, we must examine whether a soap includes storylines germane to the LGBTW community. Third, we need ask if a soap’s writers portray whatever LGBTQ characters the soap includes as three-dimensional, i.e., defined by more than their LGBTQ status. This last point takes on special relevance when analyzing daytime serials, which feature characters and storylines longer than any other media format, given the frequency and longevity with which they are broadcast. Despite being the sole half-hour soap on the daytime canvas today, CBS’ B&B skillfully fits into that half our plenty of soap operatic drama every day. One such storyline, which is the sole reason I give the soap an A, is that of Maya Avant’s being revealed as a transgender woman. Avant was a regular character on B&B, with a good deal of on-screen backstory and viewer investment in her. In a genius move, head writer Brad Bell, instead of introducing a new character and revealing her to be transgendered, revealed last year that Maya was trans. She told her boyfriend, central character Rick Forrester, not to mention her friends and coworkers, that she had undergone Gender Confirmation Surgery years earlier and is a woman, despite not having been born so. My hats off to Bill Bell for initiating this storyline, which included Maya’s marriage to her accepting and loving husband, despite the opposition of her not-so-accepting father. Soon after her younger sister agreed to be a surrogate for the couple. The storyline has shifted somewhat now, to include mostly Nicole’s struggles as a surrogate, relegating Maya to the back burner or to supporting player in other’s stories. But this was still a first—a big one—that opened doors to future non-traditional-gender storylines. And as with all soaps, Maya enters deeper into our hearts, as we see her weekly on B&B, so however and whenever the writers hopefully pick up the trans aspect of her story, we viewers will be that much more invested in it and her. Or the writers could decide not to pick up the trans aspect of her life, and instead treat it as an important part of her identity and life course, but not the only one. Days of our Lives deserves laudatory recognition for featuring a first in daytime: a gay wedding. In 2014 Will Horton and Sonny Kiriakis proclaimed their enteral commitment to each other in a lavish ceremony attended by the Who’s Who of Salem, all of them beaming and some even crying with joy at this union, one that some thought the law may never permit. Sonny and Will formed a beautiful family with Arianna Grace, Will's daughter with Gabi, and life seemed perfect for a short time. Then an ex of Sonny’s, Paul Narita, emerged on the story canvas, giving Will and Sonny the soapy honor of a love triangle! Soon after all this, though, a serial killer strangled Will, Sonny left town, and Paul receded into the background as well. Paul has returned in the past months, a part of a storyline that has nothing to do with his sexuality, which makes him more than just one of the town gays. The soap press has written with palpable excitement of Sonny’s imminent return to Salem, which will bring back an unfortunately erstwhile gay character. And, Sonny’s return will set up the possibility of a Sonny-Paul re-pairing. Hopefully complications to their reunion will follow, as you’re not a soap couple until you’ve faced adversity together! 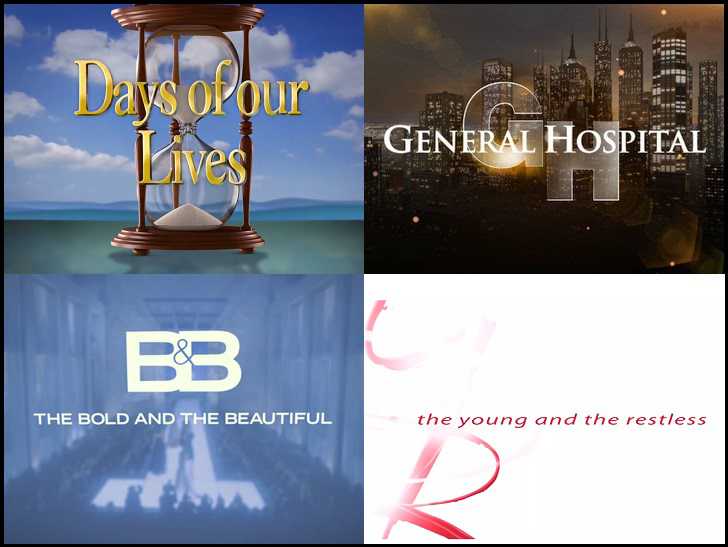 Turn on GH today, and you will see several actors with long-term contracts involved in LGBT storylines. Brad and Lucas have set a date for their wedding. And Kristina explored the possibility of a relationship with a woman she felt an attraction for. She coming out to family members, even though she still hasn’t pinpointed what she identifies as. This exploring and not identifying gives her storyline nuance, subtlety, and depth. Brava! GH has the honor of Kristina’s character and sexuality-exploration storyline being the most complex and layered in all of daytime today. The GH cast also includes a recurring character, Felix, who viewers met not as part of a “gay storyline,” but as one who had a supporting role in several other character’s lives. Soon, though, Felix became the third point in a love triangle with Brad and Lucas. Now he and Michael have joined forces to find and bring back to Port Charles his best friend, his gayness never coming up, which shows him to consist of more than just his sexuality. That Y&R still does not include on its story canvas even one LGBTQI character or concern in 2016, when such inclusion is commonplace in daytime and even television overall, leaves me dumbfounded and frankly, appalled. I love it no less than the other three daytime dramas, but I can’t imagine what has been and is going through the minds of its writers. Two things make Y&R’s radio silence on LGBTQ concerns especially galling and confounding. First, a long-term Y&R actor on contract is out—openly gay: Greg Rikaart. Rikaart last year told Gay Stars News: "I want him [the character he has portrayed for 10 years, Kevin] to come out. I think it would be a super interesting story to tell...I think it would be more socially responsible than just bringing on a gay character—to have someone on the canvas that the audience knows and thinks of as family and takes that (coming out) journey." Second, Charles Pratt Jr., Y&R’s current head writer, led the way for LGBTQ representation in primetime with his inclusion of the character of Matt Fielding, played by Doug Savant, on the series Melrose Place for almost six years of its seven-year run. Pratt, Jr. was head writer on MP for all seven years it aired. He has also had head writer positions at many daytime soaps that included gay characters. He is a friend to the LGBTQ community. So, what other force keeps Y&R the sole fantasy world in daytime where no LGBTQ people exist remains a mystery. But it forces me to give the soap an F.
Again, I hope my review of the state of LGBTQ depictions in daytime will spark discussion on this important issue. Perhaps some of daytime’s showrunners will even think and talk—maybe publicly and with fans!—about the considerations and complexities, which I’m sure exist, that they must address when deciding to add LGBTQ characters and tales to their storyscapes. And maybe you, readers, will let TPTB at the shows and networks know how you feel about these topics. And let us at know too in the Comments section below!